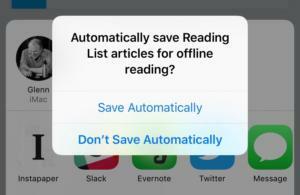 iOS prompts you when you first save an article to the Reading List. She wasn’t missing anything. Despite seemingly having all the right settings enabled to sync her Reading List across all the devices connected to her iCloud account, her marked items didn’t show up and weren’t available. What gives? Turns out, Safari for both macOS and iOS have a setting you may never have noticed, since we so often have internet access (and perhaps so rarely consult Reading List). In Safari for macOS, choose Safari > Preferences and then click Advanced. You can then check next to the Reading List label Save Articles for Offline Reading. If that option isn't checked, you can also view the Reading List in the sidebar, right-click an item, and choose Save Offline. Safari in macOS lets you mark a preference or select articles one at a time for offline reading.